2018 marks the 16th CIBC Canada Russia Series, an annual event that dates back to 2003 when current day NHL talent in Sidney Crosby (Rimouski Oceanic) and Corey Crawford (Moncton Wildcats) competed. The CHL holds an all-time record of 63-24-1-6 in the event, while Russia won its 31st game in event history in Game 4 on Monday in Oshawa. The QMJHL holds an all-time record of 17-10-3 in the CIBC Canada Russia Series and has won three of the past four Game 5 scenarios since the host format switched in 2014. The CIBC Canada Russia Series heads east to the QMJHL tied at six points apiece for the second straight year. After losing Game 6 in Moncton, Team QMJHL won last year’s series in the first ever shootout finale as Maxime Comtois (Victoriaville Tigres) scored the winner while Samuel Harvey (Rouyn-Noranda Huskies) backstopped his club to victory in goal. 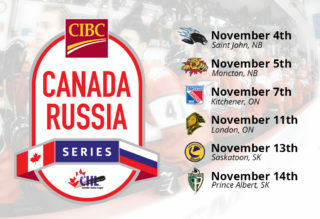 The CIBC Canada Russia Series returns to Sherbrooke for a second time. The last meeting back in 2013 saw Team QMJHL skate to a 4-3 win behind a goal and assist from Daniel Audette (Sherbrooke Phoenix). Anthony Duclair (Quebec Remparts) scored the go-ahead goal midway through the third period. MOOSEHEADS, VOLTIGEURS WELL REPRESENTED: The 2019 Memorial Cup presented by Kia host Halifax Mooseheads feature six players on Team QMJHL’s roster including defencemen Jared McIsaac, Justin Barron and Jocktan Chainey along with forwards Benoit-Olivier Groulx, Raphael Lavoie and Antoine Morand. The Drummondville Voltigeurs feature five players on the roster including goaltender Olivier Rodrigue, blueliners Nicolas Beaudin and Xavier Bernard as well as forwards Nicolas Guay and Joseph Veleno. RUSSIANS ADD TOP SCORER CHEKHOVICH, THREE OTHERS: QMJHL scoring leader Ivan Chekhovich (Baie-Comeau Drakkar) joins the Russian lineup along with other forwards in 2017 CIBC Canada Russia Series returnee Pavel Koltygin (Drummondville Voltigeurs) along with Minnesota Wild pick Alexander Khovanov (Moncton Wildcats) and Calgary Flames prospect Dmitry Zavgorodniy (Rimouski Oceanic).